The sentiment above is especially true these days where rugby seems to have no off season. The 15s portion of the year is winding down with championships and championship-like substances and, as expected, Pelicanland is well represented. Congratulations are in order for Cal who beat BYU for the Varsity Cup and that goes double for UC Davis whose women beat Virginia to claim the D1 Spring National Championship and whose men beat Notre Dame College for the D1-AA National Championship. Sacramento Amazons took home the Girls National High School Club Invitational Championship while Granite Bay matched them with the Boys National High School Club Invitational Championship. Congratulations on your victories. St Mary’s lost a heartbreaker to Life in the Di-A final while Life West and Sacramento Capitols lost in the national semifinals for D1 and D2 club. SFGG also lost in the final of the PRP to ageless nemesis Mose Timoteo and the Glendale Raptors. Great seasons for all of these clubs. Yes, we do have the best rugby in the country here. How many other unions can boast so many champions, finalists and semifinalists? After reading the previous section I am sure there will be a large contingent of angry letter-writers who will ask why I don’t recognize Cal as national champions? Or Granite Bay? After all, they put “national champion” on all of their press releases, Facebook posts, Twitterations, ect. Why am I hating? There will also be a group of deep thinkers who will sagely nod their heads at the accuracy of the nomenclature above and silently congratulate me on my journalistic rigor. The problem is that USA Rugby, through mismanagement, arrogance and lack of resources, has lost control of many of their national championships and various clubs and organizations have stepped in to fill the gap. This creates confusion across the landscape as Life University and Cal both are claiming the collegiate national championship. This is, of course, nonsense – neither can claim it. Cal has won the Varsity Cup, a 16 team invitational knockout competition that involves some of the best rugby teams in America as well as some absolute stinkers. In the first round eventual finalists Cal beat Texas 138-0 and BYU beat ASU 113-8 and those were not the only blowouts. The total score for round 1 was 507 to 92, averaging 65.375 to 11.5. It didn’t get much better in round 2 where the winners of the 2 competitive games, Utah and Dartmouth got hammered 75-15 (BYU over Dartmouth) and 58-5 (Central Washington over Utah). While there were some blowouts in the USA Rugby D1 playoffs they weren’t as large or consistent – it is obvious that these are not the 16 best teams in the country. Varsity Cup teams are invited the same way the CRC invites teams: get a couple of rugby powerhouses, mix them in with some big name football factory schools to generate press, and then throw a bone to a small unknown with a solid program. The USA Rugby D1A championship has in some ways more right to be called a national champion as it is a true play-in competition that takes conference/league winners and lets them play out. The problem with them is that too many of the top teams opt out in order to play in the Varsity Cup. You can’t claim a championship if you don’t play the best teams. It says something about the state of your national championships when the most anticipated games of the year (Cal v St Marys, Life v Arkansas St, St Mary’s v BYU, ect) are mid-season friendlies because we know then can never play off against each other for hardware. USA Rugby’s management of their national competitions was never so apparent as the awarding of a Spring National Championship to UC Davis. This truly made no sense. With the split season USA Rugby decided to crown a “cold weather” champion in the fall and have them play off in the spring against the “warm weather” champion. The only problem is that U Conn, who won the fall event, declined in January to go because of conflicts with finals. USA Rugby sat on this information until a couple of weeks before the final, and then decided to essentially award 2 championships. So who is the Women’s D1 champion? Neither, again, because apparently the D1 women need to be treated differently than every other collegiate championship USA Rugby operates. The high school championships are also in much the same boat as the Varsity Cup in that it is an invitational tournament rather than a play in championship. The organizers do try to get the best teams there but rugby ability is not always the first priority. The organization and strength of the club are also taken into consideration as well as ability to travel. Apparently there have been some very late cancellations and no-shows in the past so they are trying to cover their bases and insure a full tournament. This isn’t a bad thing and from all accounts it was forced on the organizers when the previous iteration of the tournament threatened to collapse, but it does mean this isn’t a true national championship. So where does all of that lead us? I used to be all up in arms about this incredible injustice – especially when I was still playing and this idea of a competition not controlled by USA Rugby first started with the Super League. I knew from results both nationally and locally – both head to head and via common opponents – that my club was better than half the clubs in the Super League and yet they were considered a higher level, elite competition? #@&%$ them! Nowadays I am a bit more sanguine about it. Rugby is being played now more than ever and it is even on TV. I limit myself to this annual rant and maybe a smaller one for the CRC and after that? I’ll take my cue from Jeff Lebowski and realize that well, you know, it’s just my opinion, man. The Dude abides. I don’t know about you but I take comfort in that. It’s good knowin’ he’s out there. The Dude. Takin’ ‘er easy for all us sinners. Shoosh. I sure hope more Pelican teams make the finals. Thank you for your dedication Mr McTrollface – it is fans like you that make this all worthwhile. The answer to your question is a resounding YES. The editors here at Hail Pelicus are always looking to improve the product we produce and, by extension, the experience of the readers. One thing we are particularly excited about is our upcoming series for Epic Rap Battles Of History. If you aren’t familiar with these look them up on youtube. Our first Epic Rap Battle will feature Bruce Carter against Ed Todd. We are also looking to set up other great battles such as Pete Smith vs Ben Parker. I just can’t wait to hear their sick rhymes. Well, that’s it for this season, and Ask A Pelican will be back with the next 15s season. Until then, keep those questions coming even throughout the summer! After all, if we get a particularly good one we may just put a bonus item in. This Saturday May 28 we are gorging ourselves and honoring our own. This feast is one of the highlights of the year so I hope everyone has already signed up. Attire is formal – dress to impress. Mascot checks will be enforced. Please see banquet details below. Doors open at 6:30 with lite hors d’oeuvres being served until 7:15. We’ll have a bar set up to order your own drinks and an extra one for the Hail Pelicus staff. Dinner will commence at approximately 7:15. The coveted Pelican Awards (aka The Pellies) will be handed out once the meal is finished and we are noshing on our desserts. EDITOR’S NOTE: This was mostly transcribed directly from Pelicus Iudex Pennipes’ group email. You will have noticed that I got rid of the “1830 hrs” nonsense and translated the times into proper format. You’re welcome. Not all of us were in the military, Paul. WE have been chronicling the journey of Nate Ebner as he attempted to make the transition from the NFL to 7s rugby. Apparently one of our followers here in Pelicanland read about Nate in Hail Pelicus and decided that he, too, could transition to the 7s circuit from the NFL. Yes, Jarrod Hayne decided to leave the 49ers and bring the Hayne Train to Fiji and try to make the Olympic team. It always makes us at Hail Pelicus feel all warm and gooey inside when someone gets inspired by our writings. It makes it all worthwhile. So London came and went and the World Sevens Series has finished. The big question now is did Nate Ebner do enough to make the Olympic team? I know that NBC sure hopes so as well as the formless void currently in charge of USA Rugby. Ebner’s story is tailor made for one of NBC’s patented Olympic Athlete Fluff Piece and you just can’t buy that kind of publicity. The only opinion that matters, however, belongs to Mike Friday. It is telling that last week Nate was dropped from the squad to give other players a look and that the US played much better in London, finishing 3rd after beating both New Zealand and Fiji, than in any other tournament Nate was in. Is that entirely on him? Of course not – there were other changes and a myriad of different circumstances. Personally I think that Nate did very well but my feeling is that he will not make the squad. We shall all find out when Friday makes his announcement this summer. Both teams were clearly well motivated for this playoff game, which was the first round of a 3-day tournament for the Pacific Coast area. As you saw from the score, it was somewhat one-sided, but there was still lots going on. Danville wasted little time getting on the board, scoring a converted try in just the 2nd minute. Their good runners, interplay, and propensity to break tackles resulted in 3 more tries in the first half, at 6′, 10′, and 17′ (all converted). McClatchy did fairly well when they were able to get possession of the ball, which was not as often as they would have liked, and they got a well-deserved but unconverted try at 22′. The following 8 minutes of the (30-minute) half were full of ball movement and more good running, but no further scoring. Then, just before halftime, Danville’s #5 performed a dangerous tackle on an opponent, tipping him past horizontal so he landed on his upper back/shoulder area. He was sent off, and the half ended at 28-5 shortly thereafter. The second half started much the same way as the first, with Danville scoring a converted try in the 2nd minute. This time, McClatchy got the next one in the 7th minute, though they couldn’t convert it. At 35-10, I was wondering if McClatchy could take advantage of their 14-man opponents and score a couple more tries to make things really interesting. It was not to be – Danville scored again at 10′ and 12′ (converted) to restore their healthy lead, before adding 2 more tries at 19′ and 21′. Their replacement kicker couldn’t convert those two, but it didn’t seem to matter because it was hard to notice that Danville was missing a player (except at the scrums, of course). They went on to score again at 28′ (unconverted) and at 29′, which the kicker finally converted, to leave things at 72-10. Danville clearly has something good going and I later heard that they’re ranked #1 in the nation. I don’t know if that’s true or not, but they ought to do well in the rest of this tournament. Thanks to the 3 different people that helped as ARs throughout the game. The pace of this high school game reminded me a little bit of the one I reffed in April 2010 when Napier HS (from NZ) played a combined EPA/San Mateo/Hayward side at Stanford. I was surprised to see that I had covered nearly 3 miles in a 60-minute game, which (if extrapolated) is more than most men’s games produce. If we ignore the infrequent sideways running, this is a really good sign for the future. Bay barbarians vs Union from Vancouver BC. Bay Barbarians showed up 15 minutes before kickoff which is normally a bad sign. But the Barbarians ended up scoring the first 12 points. The barbarians athletism showed with a handful of individual tries. EDITOR’S NOTE: Great report, Tim, and I’m glad to know that one team scored the first 12 points. Pity both teams scored more than 12 so we have no idea who won the game. See Bryant’s report below. This was a second day game of the three day Pacific Cup, an invitational tournament on TI of the best boy’s high school teams in the West. It was also wet. My match was McClatchy of Sacto and The Mustangs from San Diego. It was skilled rugby, hotly contested-won in overtime. McClatchy played a gunslinger style, slashing and relying on its backs. The Mustangs had a more deliberate approach, keeping the ball more in a nice sized and skilled pack. McClatchy scored first and at half was up 12-5 (I think; my card is too soggy to read). But the Mustangs persevered and tied it at 17-17 at the end of regulation time. With a minute left in OT, McClatchy utilized a penalty to dot it in the corner for a 22-17 win. Great thanks to Tim and Matthew, the Magnificent Mulhollands- both are referees who are associated with the Danville Oaks. They did about as fine a job of ARing as I have seen; lucky to have them. And another of the sons was the 4th official. What a great game to end my college season. Two very evenly matched teams, as you would hope, went at it in the stadium at SMC. The rain started about 10 minutes before kick-off and ended as I blew the final whistle. If only the weather had been dry, I think the score would have been something like 34-38. There was so much talent on the field and a decent amount of compliance too. UCD took a while to drop into their game plan of hoofing the ball down the field and refusing to play in their own half. NDC often tried to run it back with their usually outstanding running back three, but would often knock it on or lose the ball somehow. The scrums were well matched and the lineouts the same, so it would come down to who could break the opposition line more frequently, and in the end, Davis showed some quick opportunistic thinking by chipping over the backs with nobody at home for one try and quick tapping when the defense assumed they would kick for points for another. Super smart play by Davis won them the game and the repeat of the D1-AA championship. Credit has to go to NDC who still played some awesome rugby, despite the conditions and I genuinely thought they were going to open up the taps and run away with it in the second half. I can see that they will be around a lot in the future and I’ll be happy to see them again. Thanks to Neil MacDonald and Steven Fenaroli who made up an all NorCal national champ team of three and gave some great input, as well as RDC who was great at #4 too. Reffed by Mike Kelly and A/Rd by myself and Kurt Weaver. I’m not going to describe the game because it wouldn’t do it justice, just watch the video replay. The fans were great, the venue was perfect, the match official crew was outstanding. On a side note, I don’t think that a single yellow card was given over the five games. 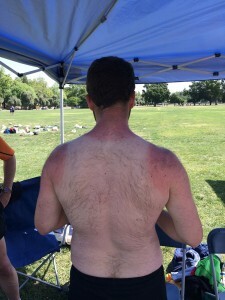 That’s college rugby at its best. I wish every weekend was as fun as that, even with the rain. Getting ready for the summer sevens season is our own David Pescetti. That’s a good look you got going there. This entry was posted in News on May 26, 2016 by James Hinkin.